Are you’re looking for the best value CNC machine, with state-of-the-art automation and features. The G-Series (a.k.a. 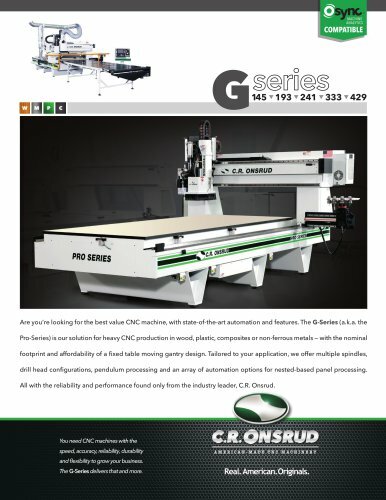 the Pro-Series) is our solution for heavy CNC production in wood, plastic, composites or non-ferrous metals — with the nominal footprint and affordability of a fixed table moving gantry design. Tailored to your application, we offer multiple spindles, drill head configurations, pendulum processing and an array of automation options for nested-based panel processing. All with the reliability and performance found only from the industry leader, C.R. Onsrud. You need CNC machines with the speed, accuracy, reliability, durability and flexibility to grow your business. The G-Series delivers that and more.